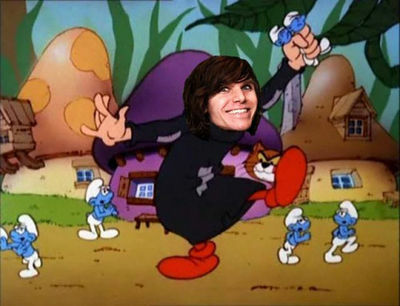 Parody picture of Greg as Gargamel with Smurfs. 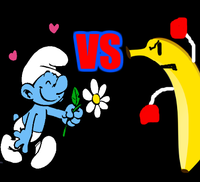 Smurfs is a name Greg gave to his haters and critics, based on the tiny creatures from the cartoon The Smurfs. He used the term for about a year. Anti-Onision blogs accepted the term and used it to describe themselves for the next couple of years. On August 17,2013 Greg first used the term "smurfs" in his "ONISION PROVEN INNOCENT!!! #ApologizeToOnision" video. In the video Greg declares his innocence against the commenters, bloggers,and vloggers that claimed he was responsible for Reptar's death. In his rant he calls his critics "smurfs" and explains this is because they dont deserve names. Later in the video, he refers to anti-onision blogs as smurf blogs. In the description, he tells viewers that believed he killed his tortise "So smurf you, smurf you, and yeah smurf you too." ($ource) This is most likley the first time Greg used the term smurf. When Greg began to use the term frequently on social media, anti-onision blogs took notice. Some liked the term because "smurfs are the good guys". Antis began calling Greg Gergamel, based on the main villan on The Smurfs, Gargamel. Antis would use the term to describe themselves for the next couple of years. This page was last modified on 21 June 2015, at 18:02.